Hull No. 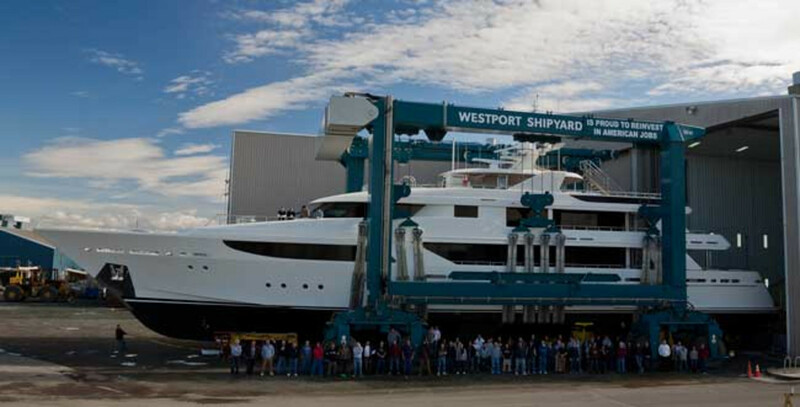 12 of Westport’s flagship 164-footer was launched this year. Management at Washington-based Westport Shipyard expects few changes following the yacht builder’s sale to Westport LLC, a group that includes members of the Louisiana-based Chouest family. The 50-year-old company, which builds yachts from 85 to 164 feet, was sold to a group led by Gary Chouest, founder of Galliano, La., shipyard Edison Chouest, in June. The company remains privately held, says marketing director Ron Nugent. The company will continue to build at its three Washington yards. It also has a sales facility in Fort Lauderdale, Fla. Though no management changes are expected — Westport president Daryl Wakefield will remain at the helm — Nugent says the company might look at some new designs and models. “I can’t give you the information on them yet, but we’ll definitely look for alternatives and things to fill in the gaps between the 112 and 130, or the 130 and 164,” Nugent said. Nugent expects some of those changes will be ready for announcement by the time the company heads to the boat shows in Cannes, Monaco and Fort Lauderdale. Westport has more than 400 employees and has built over 120 yachts since 2000. One of those customers was Gary Chouest. "Gary has always been passionate about our industry, and we are honored to count him as a customer and now our majority owner, as well," Wakefield said in a statement. General manager Dave Hagiwara, along with the rest of Westport&apos;s management team and employees, will remain in their positions. The Chouest family of companies includes substantial holdings in its primary business in the oil and gas marine transportation industry but also includes the Stuart, Fla.-based American Custom Yachts. Since 1994, ACY has maintained a 63-acre facility accommodating the design and construction of custom sportfishermen. "Similar to the history of the Chouest family business, Westport began five decades ago with a fishing fleet and has diversified into many other core businesses, focusing on customer satisfaction and the pursuit of excellence," said Chouest. "We are pleased to join the Westport family, and look forward to pursuing the synergies that exist between the Chouest companies, ACY and Westport. We will continue to pursue the employment of skilled local workers and will remain an active participant in the communities Westport serves," Chouest added.